Serious fun – not just 4 kids! Climb, slide, jump and splash – floating fun for all ages! 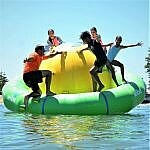 Just 4 Fun Aqua Park is situated in North Thomson Bay, near the main jetty and Visitor Centre. This inflatable floating water park has slides, trampolines, a climbing wall, moonwalk, stepping stones, a volleyball court, and even a catapult! Little one’s? We have a ‘Knee Deep’ zone for younger kids or those needing assistance. Parents are welcome to help them in the water at no extra cost. With the sandy beach, sheltered swimming area and BBQ facilities close by, this is an ideal place to spend the day.